They obviously unwrap the turban and there’s a big cartoon-style bomb with a burning fuse. Are you suggesting Indians can’t be Muslims? OH MY GOD KOMMISSAR YOU ARE RIGHT! WHAT ELSE DO JEWS LIKE ME DO ? Hold on my jewnigraph is buzzing, apparently we forgot to purchase MSNBC and tomorrow we are going to accidentally nuke pakistan. THE WORK OF A JEW IS NEVER OVER I TELL YAH. Since Indian was so large as to include all of modern day Afghanistan – which also means Pakistan. 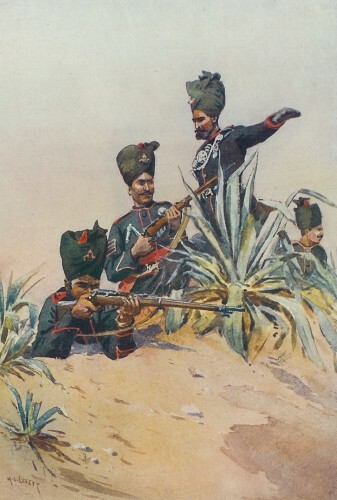 Although the Indian Sepoys where perhaps some of the most elite and famous troops of the British Empire, Moslem (British spelling during the period) soldiers fought well and bravely. For insight into this; look up W. S. Churchhill’s Indian Campaign to the Swat valley, which he wrote as a war correspondent. You might note that it is where Pakistan is fighting the taliban today.